Curitiba, Bogota, Madellin. Experience of their mayors now is heritage of urban manuals. 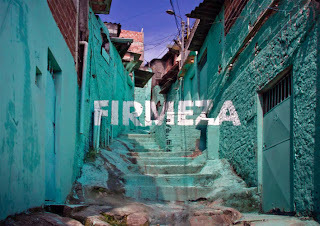 News headlines tell us about Latin American Renaissance, about how chaos transforms into order, slums into houses and criminal districts into prosperous ones. Venezuelan and Brazilian architects and urbanists go to lecture to Europe and Russia. How to transform unfavorable poor city districts into safe, comfort and pleasant social environment? Let’s look the experience of some cities. Some projects are realized by government, some by designers, artists and uncommercial undertakings. 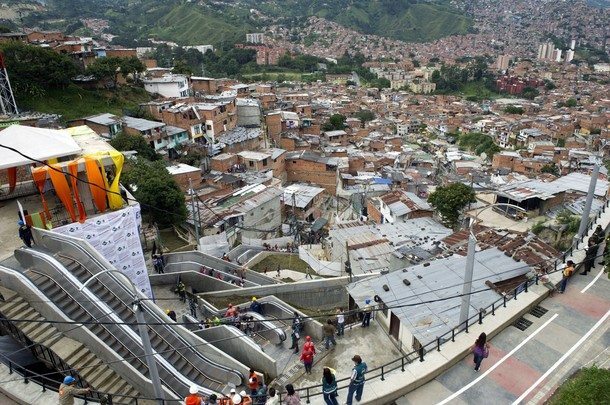 In December, 2011 residents of the poorest city district got very pleasant and useful present – an escalator in open air. 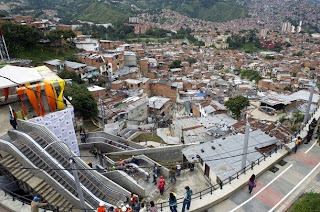 From generation to generation 12 000 people in Comuna-13 had forced walked up the stairs along a steep slope. Hundreds and hundreds steps. To feel it you should go up on foot to 28 floor of any building. 35 minutes was necessary to go up before, now the time is only 6 minutes. And escalator, you guess, is free. It has 6 sections and their common length is 384 meters. It’s cost is $6.7 million, but to organize bus communication would be costlier at times. 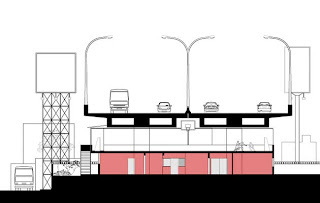 Urban-ThinkTank bureau thought up this project in 2001 and realized it in 2005. 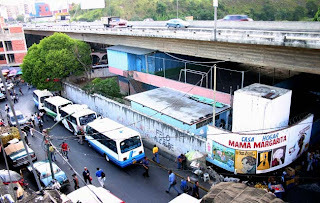 Many urbanists ignore spaces under interchanges, for example in Caracas these places are busy by street traders. But under the Francisco Fajardo highway a children playground was organized by Urban-ThinkTank. Also an orphan asylum was built here, under the road, and woodworking studio also is here. At this centre children (most of them are homeless) not only live but play and study, they are apprentice to some craftsmen. You must admit that such thing decide some social problems. There is a small garden where corn grows, upstairs from there you can get to high level where football and basketball grounds are situated. These “concrete depths” can accommodate 30 and more children and such way it fills architectural and social emptiness. Idea of the project “Vacant lots – Experimental occupations” is to look at “blind spaces” in new a new way and to detect how these places could be used. The project was realized in 2005 in the town with population of 2.5 million people and… 70 000 empty spaces. It’s not difficult to identify blind patches, they stand out against of background of city environment but they are part of it. Spaces between buildings are vacant lots, empty alleys under overpasses, desolate places. They are everywhere. Even populous slums in outskirts – favelas – are blind spaces because sometimes city authorities don’t see them. Brazilian artists decided to revive these places. Everybody of them took one space and transformed them into something new. Lots for corn and bean raising, children playgrounds, city beaches appeared. Lands under destroyed buildings in populous districts became parkings. 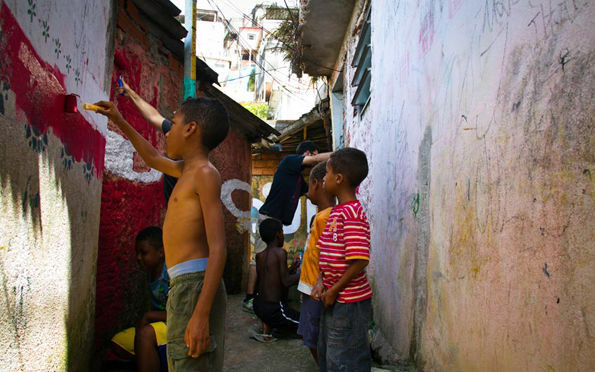 In 2011 the group of engineer, architect, advertiser and two artists called Boa Mistura (“Good Mix”) had two weeks in family living in Vila Brasilandia in favela in San Paolo outskirts. They wanted to settle in slums, look at it on the inside, feel its atmosphere, live its life and love it at the end. The project Luz Nas Vielas was a result of those two weeks. 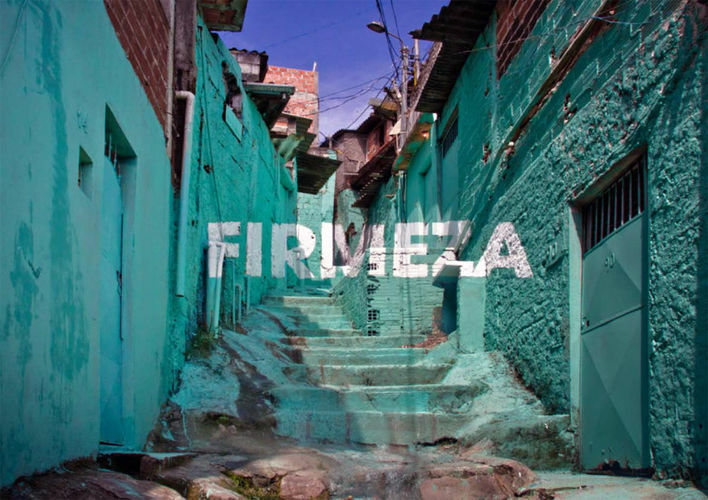 Artists and locals painted walls and twisting streets of that district by the words “beleza” (beauty), “amor” (love), “firmeza” (resoluteness). It was an excellent art intervention to the poor district life and what is more there was involvement of residents. Artists say their aim was to make people believe their forces. It was very important to understand that people can change situation and their life themselves. This project was very interesting for journalists. Citizens tired of criminal news were very glad to see themselves on TV screen like artists and men transforming their environment.